Moving Mom into a nursing home? At some point, it’s time for elderly family members to move into an assisted living situation. This can be with another family member, a friend, in-home care, or a nursing. If you’re wondering which is right for you, read our article on the factors you should consider when making this important decision. Nursing homes are the best option for many families. Moving into one is much like moving anywhere else. However, there are some important issues that need to be addressed before making the move. Once you’ve decided to move your loved one into a nursing home, it’s time to find a good one. Finding a good nursing home requires some time and effort, because there are a lot of bad ones out there, and a lot of things can go wrong. You want to make sure your loved one gets quality care and attention. Research nearby options – Try not to send your loved one too far away, otherwise visiting will be difficult. Read reviews – Check Internet reviews of the places, and run a search for newspaper articles about them — bad nursing homes are often subject to bad press. Also, try to talk to families who have or have had a loved one in the facility. Visit – Make sure to visit the nursing home and talk to representatives. Bring your loved one when you do, and talk to them about their impressions of it. Compare prices – When you get down to two or three options, compare their prices and amenities to come away with your winner. Nursing home rooms are quite small — Federal guidelines require 100 sq. ft. of free space for single rooms. 42 U.S.C. § 482.70(d)(1)(ii). A 10 x 10 ft. space will not be enough to store a house worth, or even an apartment worth of belongings. You should take time to discuss what belongings are important to your family member, and do your best to ensure that they have those things in the nursing home. Then you should consult with an attorney as to what to do with the other assets, because selling and/or transferring the assets is a complex process, which, if done wrong, can cost you a lot of money. Learn more here. 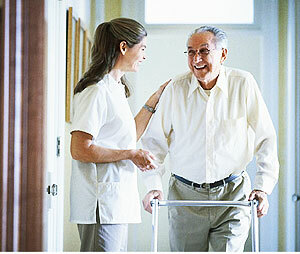 Nursing homes generally allow people to use any moving company they want to move in. However, many nursing homes also have their favorites, moving companies that are familiar with the nursing home and its intricacies. We recommend that you get some options from the nursing home, then choose one the same way as if you were moving yourself. The worst thing you can do to a loved one is put them in a nursing home and leave them there. Nursing homes are unfamiliar places filled with unfamiliar people and procedures. Not only should you take the time to personally help move your loved one into a nursing home, you should take the time to visit them there as often as you can, at least until they get used to the facility.